So here’s a tidbit that I normally don’t share. This little doggie is not a big fan of the restaurants in the immediate Harvard Square area. Let’s face it, these restaurants are for the tens of thousands of tourists, and students that live and visit our fine city. Food is turned out rather quickly, and while some restaurants handle the hustle better than others, there is just a general lack of quality in the food, not to mention the service. There are a few exceptions in my book, and the one this review is about is, Osushi. Now let me set the story. I’ve been here a few times over the years, and while my first few visits were not particularly awe inspiring I have continued to go back. I know this goes against my second rule, which is restaurants have only 2 chances to win me over. But there is something special about this place, and my visit last night sealed the deal with me. From the moment I walked in, the service was top-notch. Our waiter was friendly, personable, always around without bring intrusive or annoying, and he had a great sense of humor and personality, something seriously lacking in the restaurant world of late. The vegetarian gyoza (pan-fried) were done to absolute perfection. They were soft and tender on top, golden and caramelized on the bottom. 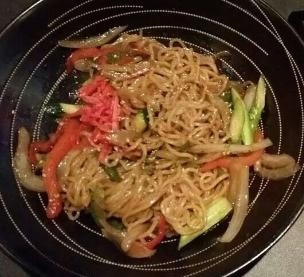 For my entrée, I ordered Yaki Soba a warm and flavorful dish of stir-fried ramen noodles with vegetables, ginger, and soy sauce. Everything about this dish was perfection with every chopstick portion giving off wonderful aromas and tantalizing flavors. This is a must have on their menu. So if you find yourself in Harvard Square and wanting something other than quick serve, assembly line type food, consider getting your little paws over to Osushi. You won’t be disappointed. When in Cambridge, one walks everywhere. Last Wednesday, my first day in Cambridge, I did just that. I walked until my little paws were shall I say, dog tired. So I decided to stop in to the new restaurant, Cancun Taqueria on Massachusetts Avenue to rest my weary paws and to see what this place is all about. The service was impeccable, and not to mention handsome <wink>. The menu is extensive and after some wavering of my taste buds, I ordered the chile relleno. The chips and salsa were by far the best I’ve ever had in Cambridge. The salsa, cold and absolutely fresh with chucks of tomatoes, onions ,and well appointed with lots of cilantro. It also carried a nice bite to it. The rellenos came with refried beans, which were creamy, smoky, and delicious. The rice was cooked to perfection but unfortunately lacked any seasoning whatsoever. The plate was accented with crisp lettuce and more of their wonderful salsa. The chile relleno itself was well prepared, perfectly deep-fried with a wonderful red sauce. My only problem with the relleno (and I must add no fault of the restaurant) was that the chile itself was so freaking hot that it literally affected my little taste buds so that after a while I couldn’t taste anything. I will definitely give Cancun Taqueria another try because I believe there is great potential with this restaurant. They just need to make sure the entire plate is perfect. With love from my dog bowl to yours…. happy eating. What can one little dog say about the food scene in Cambridge/Boston that hasn’t been said before. With thousands of outstanding restaurants to choose from what is this little doggy to do? Our last night in Cambridge promised to be a wonderful evening, spending it with old friends and at a restaurant that I had always wanted to eat at when we lived here but somehow never managed to find myself at (thank to you know who). 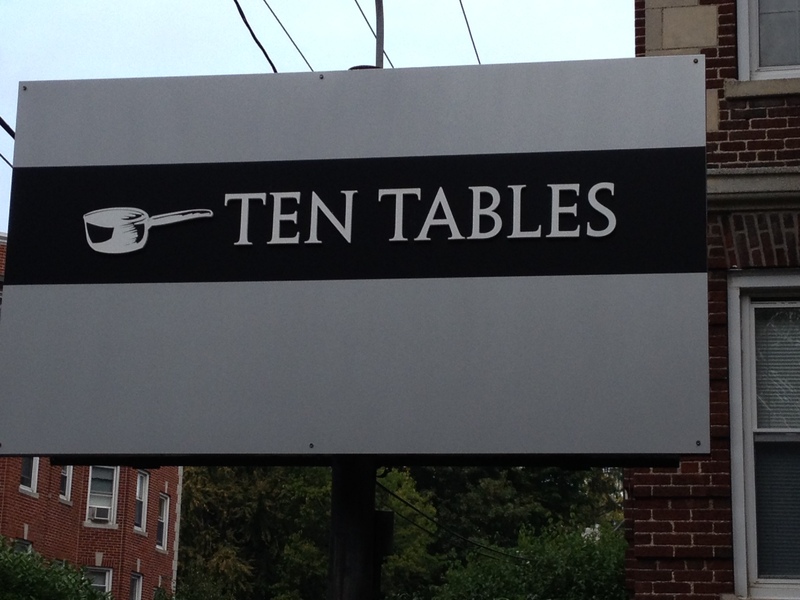 Unfortunately, Ten Tables was a mixed bag. The service was impeccable and friendly. The appetizer I ordered was a celery root soup with pear jam and house made croutons drizzled with walnut oil. The first spoonful sent me over the edge of happy. The delicate flavor of the celery root with the sweetness of the pear jam was a marriage made in heaven. If only the entree could have been as delicious as the soup, this would be a much different review. I have recently decided to try my hand at being a vegetarian, while I’m not going to get all crazy about it, I am determined to eat healthier. Unfortunately, Ten Table only had one vegetarian option on the small limited menu. It sounded wonderful, so I was happy to order it. Gnocchi with wild mushrooms, spinach and a gorgonzola cream sauce. Sounds good doesn’t it? Well, I would have rather chewed on table scraps from the next table over. The gorgonzola cream sauce was so overpowering, the rest of the ingredients may as well not have even been in the bowl. Seriously, give me the cheese sauce and some warm bread, but don’t insult the other ingredients by serving them with the overbearing sauce. If you’re a meat eater, you’re going to love this place. If you’re a vegetarian, go elsewhere. With Love, from my dog bowl to yours….happy eating. I had the honor and privilege of having lunch with Bill and Stacy today, and a new hot spot in Central Square, Cambridge. 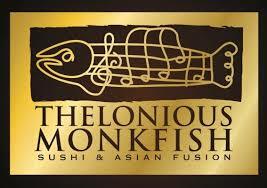 Thelonious Monkfish is a sushi asian fusion restaurant that calls itself Jazz for the Palate! There is actually live jazz on the weekends for dinner, however even without the live music, this place rocks! The decor is both hip and relaxing in an open table atmosphere. The waiters are…oh how shall I put this mildly…they are smokin’ hot – which just adds to the dining pleasure, or pleasures as the case may be. I got to sample both of the dishes that were ordered today and frankly they were both equally as good. Bill ordered the standard Pad Thai. The noodles were cooked to perfection, soft with a little bite left in them allowing them to hold up well to the abundant amounts of chicken, bean sprouts and crushed peanuts. It was one of the best Pad Thai’s I’ve had since moving to the Northeast. Stacy, the adventurous one, ordered Noodles Nirvana. This dish was simply out of this world delicious. The egg noodles were also cooked to perfection and were accompanied by a variety of wok-fried vegetables. All this was toss in a shiitake mushroom sauce that was rich without being to heavy and a symphony of tastes for the palate. The menu is so extensive that you could go back every day for months and still not sample everything that is offered. And did I mention the price? The total bill for both lunches came to under $18.00. You can’t go wrong with Thelonious Monkfish.